Our cat Julian is a very curious and spunky eight-month-old kitten. Recently I came across a website which introduced the concept of homemade puzzle feeders. This seemed like something Julian would really enjoy, and so I decided to try it out. If the toy failed miserably I could simply recycle it later. 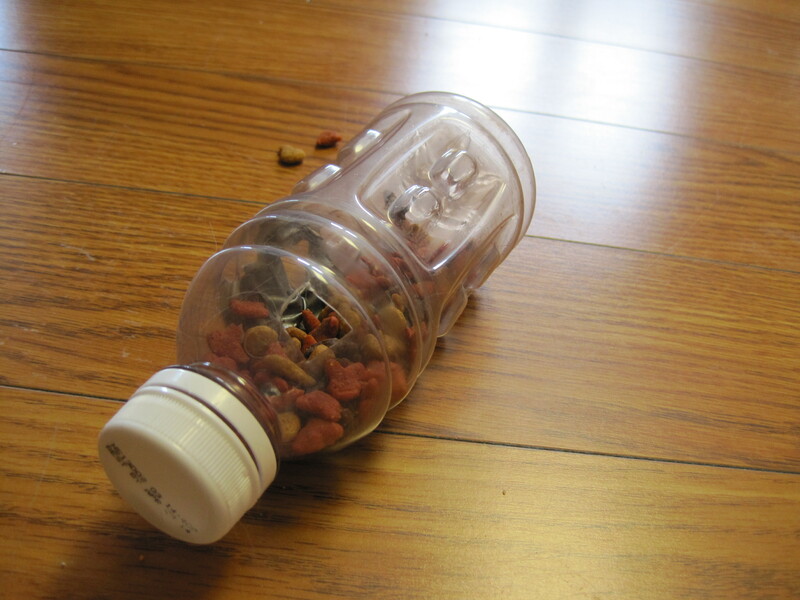 I took a rinsed out bottle, cut little holes in it with a utility knife, and filled it with kibble bits. 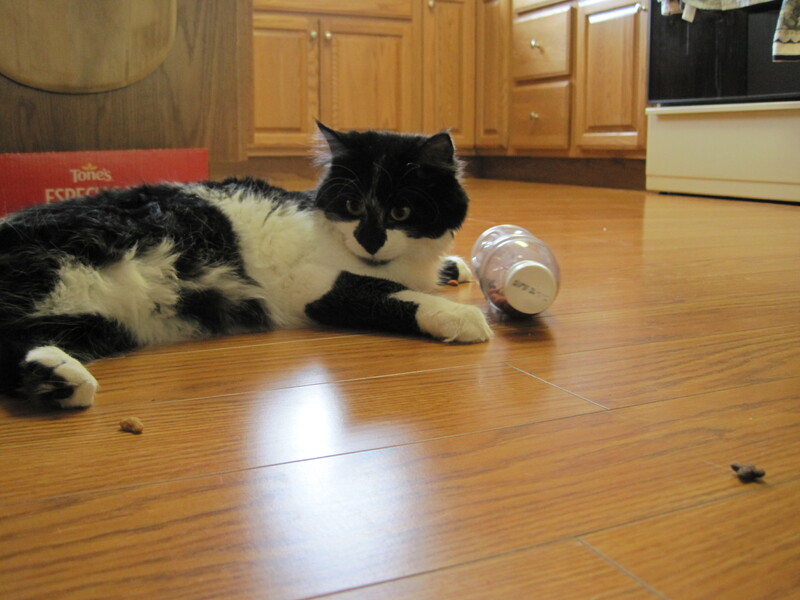 Julian then has the challenge of figuring out how to get the kibble out of the bottle. I wasn’t sure how much she would really enjoy it, but was pleasantly surprised at how much fun she has with it. Once she gets the kibble out, she’ll swat it across the floor, chase it down and eat it. It’s quite amusing to watch. 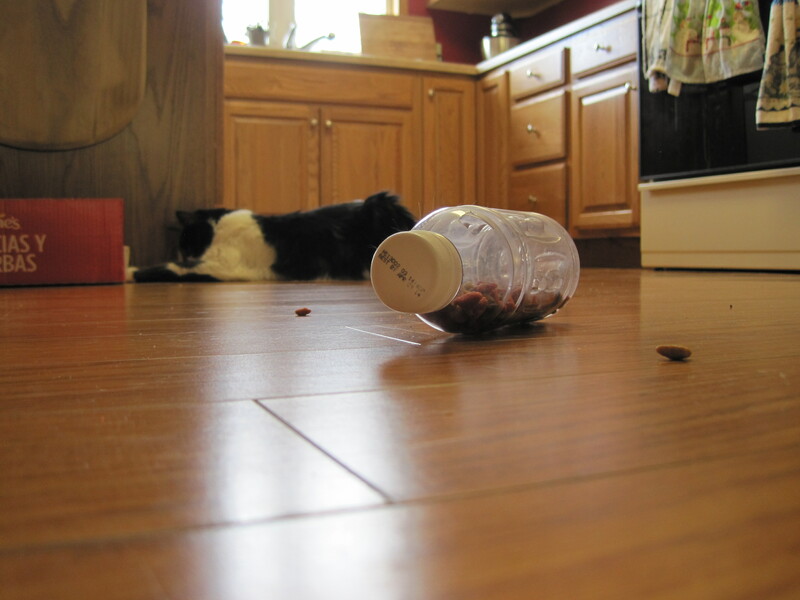 If your cat is a messy eater, this may be less fun. Fortunately, Julian makes sure she eats every single one of her treats and doesn’t leave a mess. I did something similar with ping pong balls. Will have to try a bottle. Keep em thinkin’!!!! Ping pong balls is a neat idea too! Really neat idea. I’ll have to try this with my kitties!